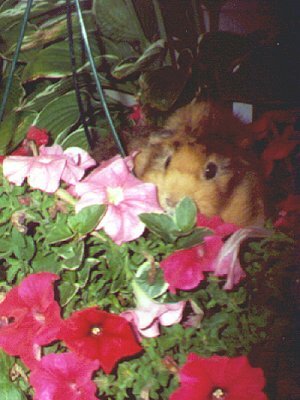 The following pictures were taken of Roddy the summer of 2000. This one was set up and it came out very nice. 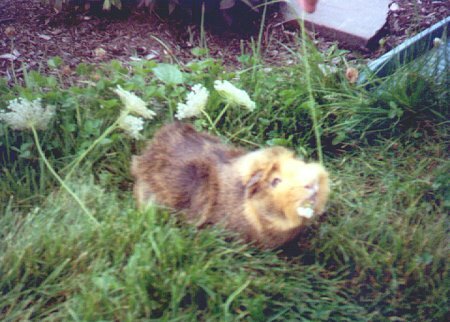 Here is Roddy enjoying some sweet grass on the lawn. He loves to play! This picture of came out a little blury because I was too close when I shot it, but I think I captured Roddy pretty well here! Isn't he a sweetie pie?! 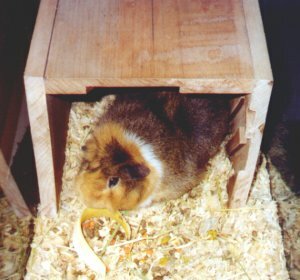 Roddy's manic consumption of banana PEELS is the oddest thing he does. He loves them. 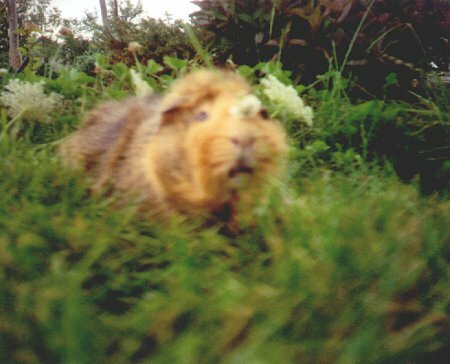 I had given my first guinea pig, Stella, the actual banana part before. Roddy didn't like this part. We only discovered his madness for the banana peels about a year and a half ago when my father was trying to feed him some banana and he went for the peel like a maniac! He likes the peels better than LETTUCE, if you can imagine this. If anyone has a guinea pig with this strange taste for the peel, let me know!! !